Looking for a dynamic corporate entertainer that will make your event unforgettable? 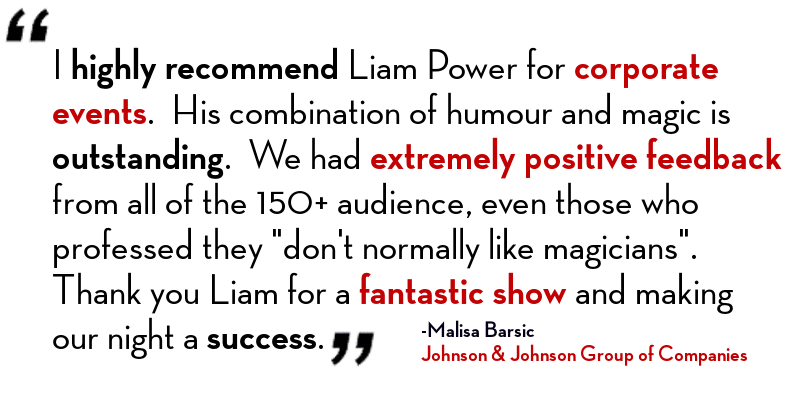 Liam Power is one of Australia’s most sought after corporate entertainers, he creates mind blowing, fun and exciting magic performances, that create lasting memories. Liam performs close up magic to small groups of guests. As he moves around your event Liam will have your guests actively involved in tricks, laughing, chatting and being amazed. Perfect for cocktail parties, product launches, award nights, Christmas parties, EOFY events and conferences. Liam’s close up performances are interactive, high energy and in most cases he is able to come up with custom tricks involving your company’s product and or message!